The Flymop Spin Mop and Bucket has been discontinued. This lightweight and durable spin mop by Flymop offers maximum wringing speed while minimizing the labor. The pedal-free fast-spinning Cylinder technology removes more water, dirt and debris at a faster speed than pedal driven mops. The Turbo Deceleration technology effectively reduces spinning pressure allowing you to rinse your mop with less effort. The super absorbent microfiber cloth also act as a magnet and can be used to dust your floors, surfaces and windows attracting and removing dust, dirt, pet hair, dander and more. These durable microfiber cloths are also machine washable and can be reused over and over again. Maneuvering around corners and furniture and even getting to those hard-to-reach places is effortless due to the complete 360-degree rotating swivel head. And easily drag your bucket along for the ride with its 4 omni-directional wheels for hands-free maneuvering. No messes, drips, getting your hands wet or even bending over. The Flymop spin mop is an easy, effective and time-saving choice for all your messes, on all your surfaces. This effortless spin mop and bucket system by Flymop features powerful cleaning with high-speed wringing for maximum cleaning in less time. Perfect for every surface in your home including windows. Extended handle and super absorbent microfiber cloth ensures even those hard-to-reach areas will shine. 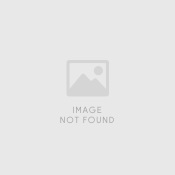 All of us want a healthy and clean home and of course would love to accomplish this in the easiest and shortest time possible. Our experts were pleasantly surprised at just how easy and convenient the Flymop spin mop and bucket system actually is. No drips, messes or ever even getting your hands wet. Perfect for every surface in your home, whether mopping, dusting, polishing or even dusting windows. 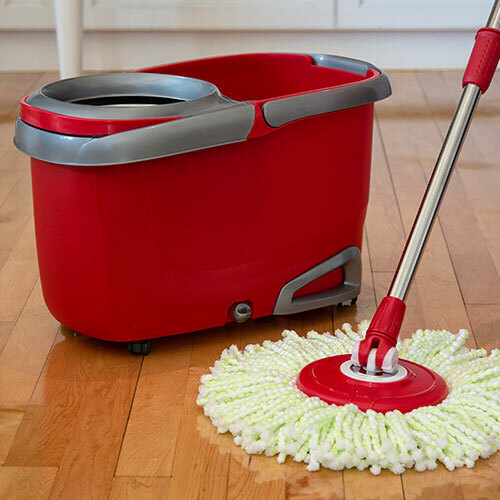 The cylinder cleaning and turbo technology effectively removes dirt and debris off of the mop and spins it away, leaving your mop clean every time. The super absorbent microfiber cloth acts as a magnetic attracting, lifting and removing dust, dirt, pet hair, dander and more. 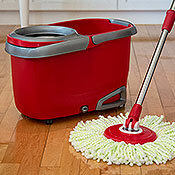 The Flymop spin mop and bucket system is a new safe and effective choice for mop cleaning today. Mop Head Cloth Dimensions 15"
Handle Length 39" - 51"
Specially designed for the Flymop Spin mop. Durable cloth is suitable for machine-washing. Includes 2 microfiber replacement heads.